Full title: The Lord of the Rings – and other bookbindings. 200 x 165mm, 61p, Illust., line drawings and photographic plates. Cover of stiff sliver card, decorated and lettered in black. Philip Smith’s first publication. Illustrated and with with technical notes by the highly innovative and distinctive design binder. 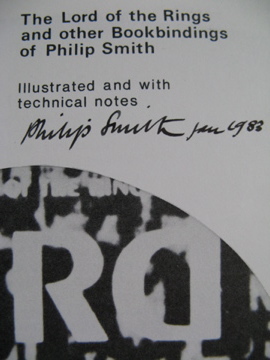 SIGNED ‘PHILIP SMITH, Jan. 1983’ in ink to the title. Signature of ‘R. Stables’ to the pastedown. Slight lifting to the silver coating of the card to the upper joint, otherwise fine. VERY RARE. Author: TOWN, Laurence. Published by: Faber and Faber (London, 1963). 8vo., 297p, Illust. with line drawings throughout. Later half leather binding with cloth sides. 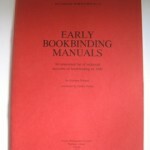 A re-bound copy of the 2nd edition. 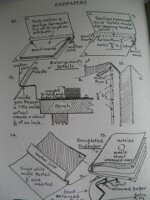 A ‘step by step’ manual of bookbinding by an experienced teacher of the craft. Spine light affected, otherwise a sound copy. Read more.